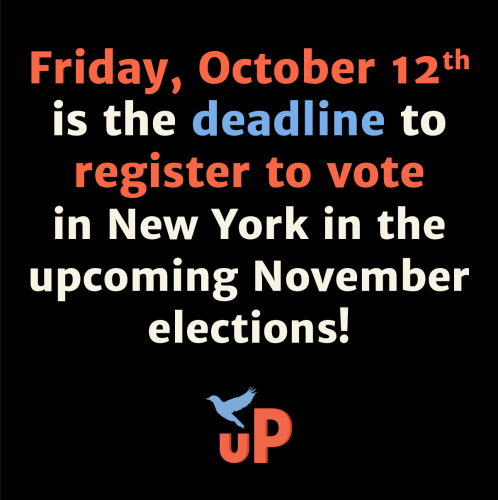 Friday, October 12th is the LAST day to register to vote in New York in the upcoming November elections! Not only that, is is also the LAST DAY to change your party affiliation in advance of the 2019 primary elections — a whole year away! Register in-person at the Ulster County Board of Elections (284 Wall Street during business hours. Fill out, Print, Sign, and Mail a Registration Form in English or Spanish. Even if you’re already registered, PLEASE take a moment right now to double-check. Especially if you’ve moved recently. But even if you haven’t. New York State is notorious for purging voters from the rolls. We need to be vigilant! Your political party is the one whose primary you want to vote in. Your voter status is active. Please join Ulster People for Justice & Democracy on Monday, 10/1 for our October general meeting! This month we’ll be joined by Joyce St. George, Democratic candidate for New York State Senate District 51 and retired corruption investigator. St. George will discuss her research on Reclaim NY, a right-wing campaign funded by the Mercer Family (and initially directed by Steve Bannon) to strain and disrupt our local governments and school districts. Reclaim NY has recently become active in Ulster County, making it all the more urgent to we understand their mission and tactics. So please invite your friends and neighbors to join us on Monday! Report backs from our working groups, including how to get involved in helping to elect our endorsed candidates! Our members vote on whether to Antonio Delgado in the congressional race (endorsements require support of 2/3 of our voting members). 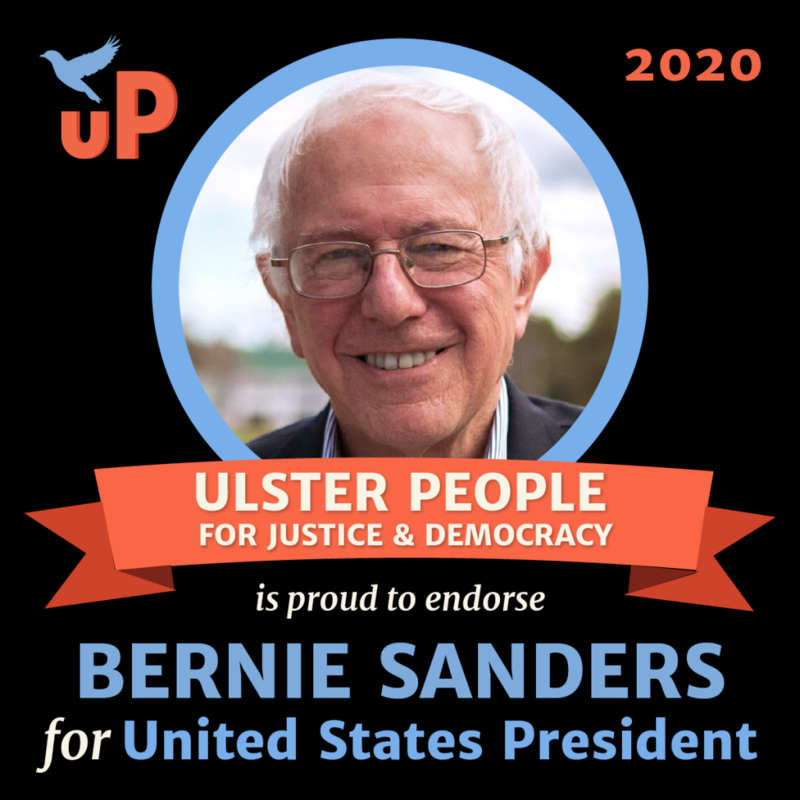 Please join Ulster People for Justice & Democracy at our August general meeting! This month we’ll be joined by economist Pavlina Tcherneva of Bard College to talk about her proposal for a Federal Job Guarantee. Prof. Tcherneva is a leading scholar of Modern Monetary Theory (MMT) and has advised both Bernie Sanders and Alexandria Ocasio-Cortez. Discussion of whether to endorse Antonio Delgado in the congressional race (with a vote tentatively scheduled for September’s general meeting on 9/4). This meeting is open to the public, but only voting members are eligible to vote on organizational business and will be given priority during discussion of such. Details of our membership policy can be found here. If you support our platform and would like to become a voting member, this meeting will be a great way to learn about opportunities to meet the volunteer requirement for voting membership. Please join us at March for Our Lives Hudson Valley! We will meet on the Poughkeepsie side of the Walkway Over the Hudson at 11:00am and gather for speakers, followed by a march over the Hudson River. Thanks to all our supporters. Let the Hudson Valley really show the students of Parkland how much we care!